Words matter. They carry incredible power and reveal our underlying attitudes and assumptions. The words you choose each day can serve to lift others up or tear them down. Your words will build stronger relationships or they will push people away. Your words will inspire more commitment and dedication or they will find excuses or shift blame. The most successful educators are intentional with their words. They strive for the greatest impact for their students and for their entire school through what they say and do. They speak from the heart and express a desire to serve and help in every situation. They make people and learning top priorities, in that order. They care deeply about students and their success. Being a teacher is a difficult job. It's a calling. Your work is valuable, far too valuable to jeopardize by using any of the phrases below. You can't afford to allow negativity to creep in. There are too many challenges and only with a positive mindset will you be able to find success. In education, our bottom line does not involve profits or increased sales. Our bottom line is helping kids succeed. So when there is something that might technically be outside of your job description, remember that you entered the profession to make an impact and making an impact can involve serving in many ways. You are a powerful example when you step up and take on whatever challenge comes your way. So your job is anything that helps students and learning. If you have legitimate concerns about your role, you should talk with your principal about those things. There should be strong support systems around teachers. And teachers need to advocate for what they need. But when you wield this phrase, it just makes you look like you're not a team player. 2. "Those aren't my kids." If you could pick and choose the students in your classes, of course your job would be easier. But successful teachers are advocates for ALL kids, even the ones who are difficult, demanding, or disrespectful. Some teachers think special needs students are not their responsibility. They shrug their shoulders thinking how the special education teacher or the ELL instructor should be the ones to support any struggling learners. This phrase really doesn't show the kind of compassion or empathy all great teachers display. 3. "There's not enough time." You may feel like you don't have enough time. Everyone feels that way sometimes. But the truth is we all have the same amount of time in each day. Your hours and minutes are the same as every other human on the planet. So when you say you don't have enough time, you are really just saying it's not a priority. The things you don't have time for are not high enough priority for you to give it your time. Life is definitely not fair. But it doesn't do any good to use this phrase. Usually, it's just a way of blaming or complaining and that doesn't help anyone. When something doesn't seem fair, don't use this phrase. Tell yourself the truth. You can only control you. Do something to work around the issue. Be grateful for when things do work out your way. When we are grateful, even difficult things seem to work back in our favor eventually. 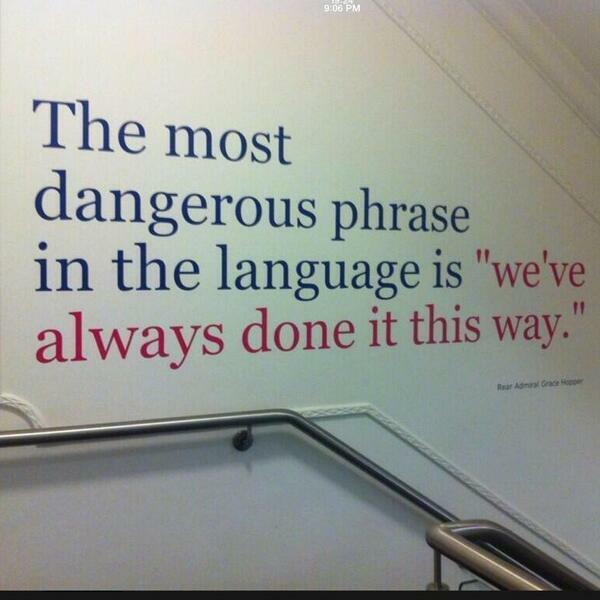 Sometimes this phrase is used by teachers as a reason not to differentiate or modify instruction for students. But we shouldn't confuse fairness and equality. We need to give students what they need, not treat a student exactly like another who may have completely different needs. 5. "I taught it, but they didn't learn it." Just because you taught it doesn't mean they learned, and it's not okay to shift the blame to your students. Maybe you need to reflect on your methods and consider what you can do differently to create better learning. If you want to change student learning, you have to be willing to change yourself first. 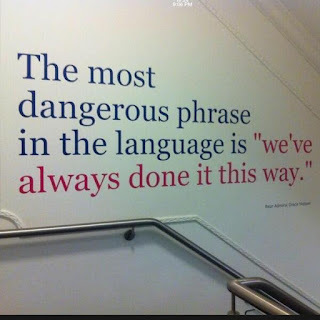 This phrase shows a desire to do things "my way" regardless of whether it's working for students or not. 6. "We've always done it this way." This has been coined the most dangerous phrase in the language. When you use this phrase, it shows you to be closed minded, inflexible, and possibly even stuck in the past. We can't think creatively or make progress with new ideas if we are so stuck in our paradigms we can't see the possibilities in something new. It's rare to actually here a teacher say this, but I wonder how often this type of thinking is just under the surface. We can get really comfortable doing things the way we've always done them. The most successful educators are willing to step out and take risks. 7. "But that won't work with these students." When presented with a new idea or possibility, some educators think right away, "But that won't work with our students." Our students are different. They are impoverished, apathetic, troubled, uncooperative, etc. But how do you know what will or won't work unless you try? And trying with a positive attitude is much more likely to result in success than assuming your students are going to fail. If teachers don't believe in their students, who will? The best educators make students feel like they are better than what they ever believed. They are inspirational. 8. "I don't need any help." No one ever accomplished anything without help for others. We always need help and also benefit from giving help to those around us. This cavalier attitude works against positive relationships and sharing, and quite frankly it works against learning. Learning is a social enterprise. We learn better when we test ideas and gain feedback. To have the best school, we need to have the best teachers and leaders. If you think you can do it all on your own, you are not going to grow and be as successful as possible.